The Fear of Flying Workbook will help you overcome aviophobia. Here is a fear of flying workbook that will show you how to solve the problem of fear of flying, and regain your freedom to travel, without medications, as simply and directly as possible. One in six Americans struggles with a persistent fear of flying which limits vacations, creates strife among family members who want to travel together, and blocks promotions and career advancement. All too often, people suffer in shame and secrecy without ever finding a clear path to overcome this common and solvable problem. And yet, this is a very solvable problem. 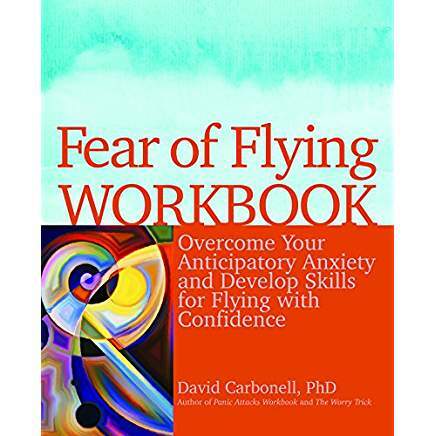 The Fear of Flying Workbook takes the methods I’ve used in my workshop for fearful fliers for the past 20 years and hones them into a self help program you can use on your own. Like my two previous books, Panic Attacks Workbook and The Worry Trick, it offers specific, concrete steps you can take to overcome this fear. It will steer you around the pitfalls people often encounter as they try to solve this problem – trying too hard to get rid of your fear, struggling with obsessive worries about safety, and unhelpful arguing with your anticipatory worries in a vain effort to clear your mind of fears. Instead, the book offers some surprising steps that will help you approach the problem in a new way, and find a different way to relate to the fear, one that allows you to fly, whenever and wherever you wish, with increasing comfort. The paperback lists for $15.95, but is available here at the discounted price of $11.95 plus shipping. Click here to order your paperback copy. An audio book version is also available for immediate download, for $12.95. Click here to order the audio book. Save $11 by ordering all three of my self help books together. Click here. "Just as he did in Panic Attacks Workbook, Dave has written about difficult concepts in a way that is readable, approachable, and gives individuals real hope as well as concrete strategies they can use as they learn to relate differently to their fears around flying. A must read for any fearful flyer. Stephnie Thomas, LCPC, is an Associate and Fear of Flying Specialist with the Anxiety & Stress Disorders Institute in Towson, MD. "Dr. Carbonell's Fear of Flying Workbook is superb and a must-read for the fearful flyer. The author has been successfully treating fear of flying folks for nearly three decades and penned several books on anxiety. The workbook explains the basis of the fear from both psychological and neurological perspectives but in a lay person's vernacular. A tad of levity in Dr. Carbonell's delivery also adds nicely for a subject likely to invoke anxiety for the fearful flyer." Dr. Boyd is the Owner/Director of a fear of flying program in Houston, TX. He has written articles on the subject published in aerospace medical journals, and chaired two fear of flying panels at the annual meeting of the Aerospace Medical Association. Click on the cover to order the paperback edition.